These beaded wreath ornaments are so easy to do that you may want to make a bunch of them to decorate the Christmas tree. The crystal facets reflect the light and look like expensive, designer ornaments; only you will know the difference! The amount of beads will depend on the desired size. For this wreath, I used 24 Sunburst beads. Cut a piece of wire about one inch larger than the desired finished size for your wreath. Feed your beads onto the wire. Using pliers, twist the wire to secure the circle of beads. 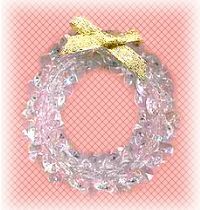 The use of sunburst or tri-beads will help in forming a perfect circle for the wreath as these beads lock into each other. Cut away any excess wire and attach a small ribbon bow with either wire or hot glue.